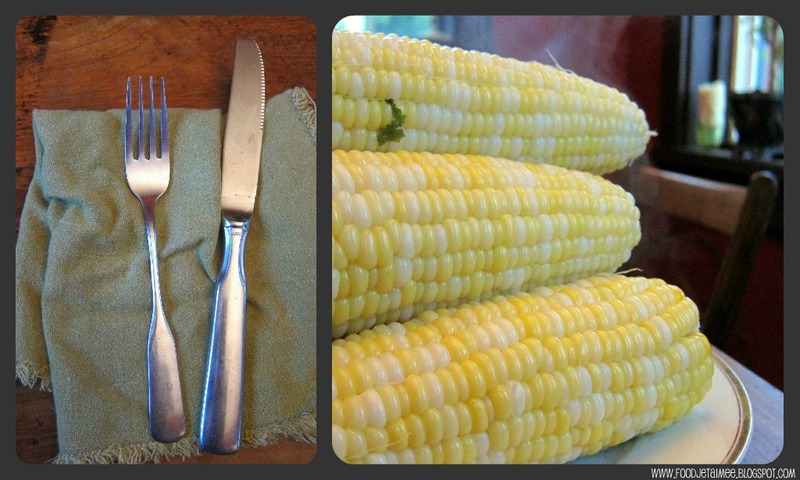 I was feeling inspired after reading this beautifully nostalgic post from Jamie (Life's A Feast) a little while ago, about American versus French barbecues. 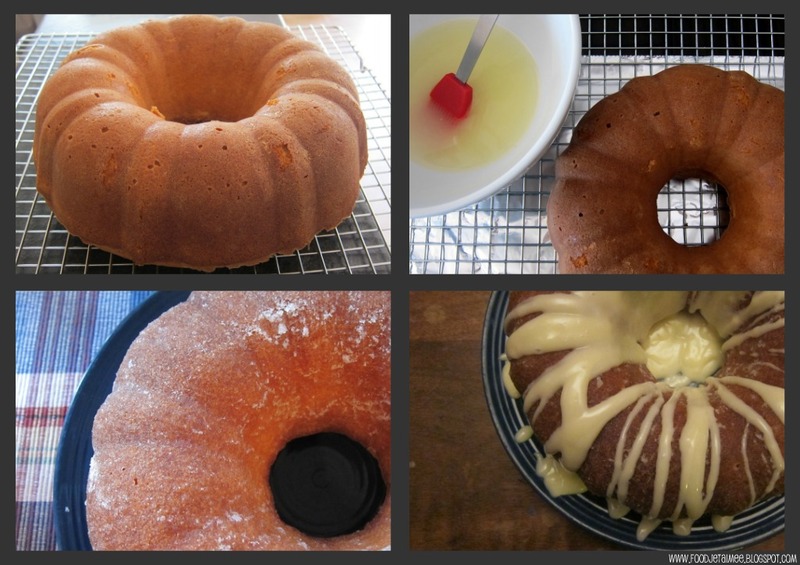 Knowing I was going to spend a lovely weekend in the Annapolis Valley last week, at two separate barbecues, I really wanted to try making her Glazed Lemon Bundt Cake, which she wrote about in that post. I wound up making two of these beauties: one for the Saturday barbecue with my family and some friends from Halifax, and one for the Sunday soirée with our Valley-residing friends. For the first barbecue, I stayed true to the recipe, simply topping the cake with the lemon juice and sugar and letting it soak in. Both my mother and I agreed with Jamie's prognosis that this cake is deceptive: while seemingly plain, that sugary, lemony goodness is more than enough to complement the moist, delicate cake. However, having received some requests from both F. and my father for a 'topping' of some sort, I decided to appease the men in my life for round two. For the topping, I used the same cream cheese glaze recipe I used for the Amaretto and Raisin Muffins, only I added a some lemon zest and freshly-squeezed juice to the mixture. Admittedly, even though I liked this cake in its simpler form, I've got cream cheese on the mind these days and that lemony, creamy goodness was wickedly delicious! Saturday's cake on the left, Sunday's on the right. Drizzling, I'm learning, is a bit of an art form. A bit over-zealous, am I not? Our barbecue on Sunday night was with friends Jenny and Sean (see my rambling homage to Jenny and the company of good people, in general, here) at their beautiful home near the Bay of Fundy. When I say 'beautiful', it seems trite: I stopped in my tracks upon entering Jenny's home, in awe of seeing my own dreams manifested in someone else's homestead. Jenny also keeps a chicken coop in her yard and she every-so-kindly sent me home with a dozen, freshly laid eggs. I've been buying eggs of this sort from the farmers' market lately, but nothing has compared to the freshness of these eggs. As it happens, I had also just finished reading the 'Egg Moon' chapter in a book called Full Moon Feast by Jessica Prentice - a powerful and fascinating read - and all I can say is that the difference between eggs laid from happy, healthy hens and those run-of-the-mill, laid-under-duress, mass-produced eggs found at the supermarket is astounding. Prentice writes passionately and in depth on the topic, and I'd highly recommend picking up her book. I savoured my dozen from Jenny along as long as I could, but now I've officially been spoiled by her generosity: F. will not only have to put up with my kimchi pots in the back yard next year, but a chicken coop, too! I know he'll LOVE this idea. 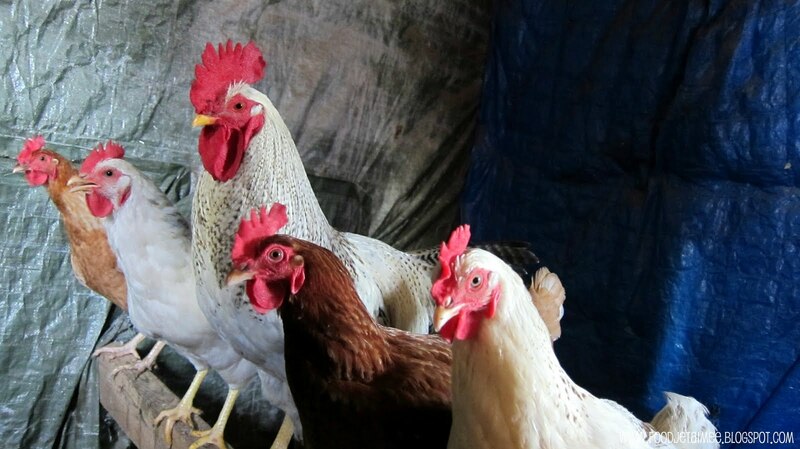 Jenny's beautiful chickens, caught in a rare, stoic pose! 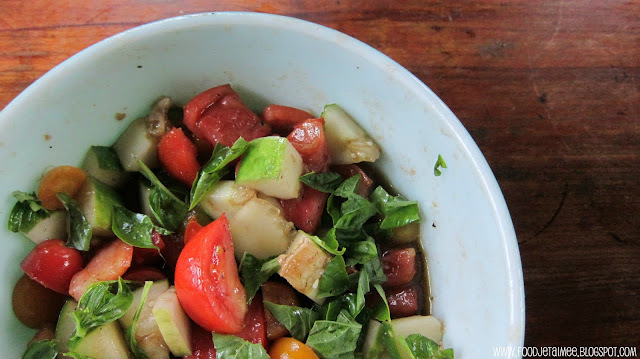 Tomato, Cucumber and Basil salad, all freshly picked from Jenny's garden. We had much more to eat than shown in the photos, of course, but at some point, even the most ardent food lover needs to set down their camera and soak up the moment: a hazy, late summer night, in the most excellent of company, in a beautiful home, with food that was bursting with freshness and flavour, straight from one much-loved garden. While I've certainly become much more comfortable with baking in the past month or so, I'm still not confident enough to really branch out and experiment with my own recipes, the way I do with cooking. It's a journey and one I'm infinitely pleased to be on. Maybe, with a little more time, a little more flour, I'll start dreaming up my own baked concoctions. 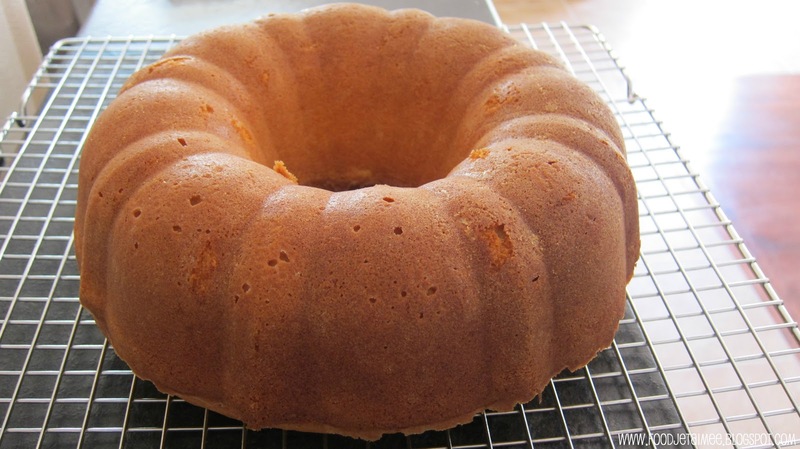 For now, you can find the recipe for the Glazed Lemon Bundt Cake on Jamie's blog, Life's A Feast. 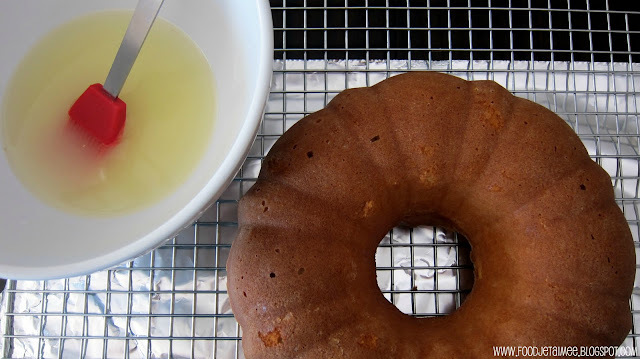 Combine all glaze ingredients in a medium bowl and beat with an electric mixer until smooth. Drizzle over the top of the bundt cake and serve. In other news, I can't begin to tell you how wonderful my 30th birthday has been, and it's not even over yet! Thank you so much for all your well wishes over the past couple of days. I have been absolutely spoiled rotten! I won't be able to participate in Muffin Monday this week - more on that later - so make sure you still drop by Baker Street on Monday to check out the latest recipe and the wonderful bakers behind it! I love the fusion of jamie's bundt and your cream cheese icing. Sure it tasted brilliant. Oh yum, so just lemon juice and sugar? I bet it does taste delicious, citrusy heaven! Will need to try that! Yum! Both variations look awesome, but I'm a glaze kinda guy, so I'll take Sunday's cake please :) Sounds like a cool book. Will have to look for it. Always wanted to raise chickens. And quail, and goats, and cows, and....lol Glad you had a great B'day! You know, I've never tried a cream cheese topping on a lemon cake before, I've always preferred the "plain-ness". Will have to try it your way. Have been trying for years to get G to let me keep chickens - no joy - he claims the 4 kids are enough! Absolutely love the pic of the chickens! I love it! And I can just taste your cream cheese frosting on this cake - I'll bet it did add that mch more tangy flavor which is perfect for the cake. And it is soooo pretty! You know I love that Jackson Pollack drizzle look! I LOVE when bake my cakes! Love it! Now when can we actually bake together? Hee hee. I'll have to show the chickens how gorgeous they all look in their closeup! The cake was absolutely divine, almost even better the next day when the creamy glaze had soaked in a bit. Oy! We absolutely adore your company and were tickled by this post.